Complete this program and gain several strategies and experiential exercises that will help your client manage stress…and not carry it! You will learn how stress can be positive and how to use it as a motivational tool in treatment. Discover new techniques to help your client to regulate their emotions and cope with intense emotions, such as stress resiliency activities, mood logs, and mindfulness. Judy Belmont, MS, LPC, author of bestselling Tips and Tools for the Therapeutic Toolbox series, will offer you practical tips to easily incorporate in your practice. Learn innovative and psycho-educational tips derived from Cognitive Behavioral Therapy, Dialectical Behavioral Therapy, Acceptance and Commitment Therapy and Mindfulness Based Cognitive Therapy that you can add to your emotional regulation and stress management toolbox. 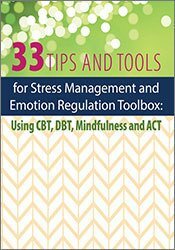 Integrate strategies from DBT, ACT, and MBCT into treatment of stress and emotion regulation. Describe the positive and negative aspects of stress. Show experiential stress management and emotional regulation activities to use with individuals and groups. Illustrate how mindfulness and acceptance can help regulate emotions and manage stress. Prepare valuable handouts and worksheets to help your client manage stress and regulate emotion.